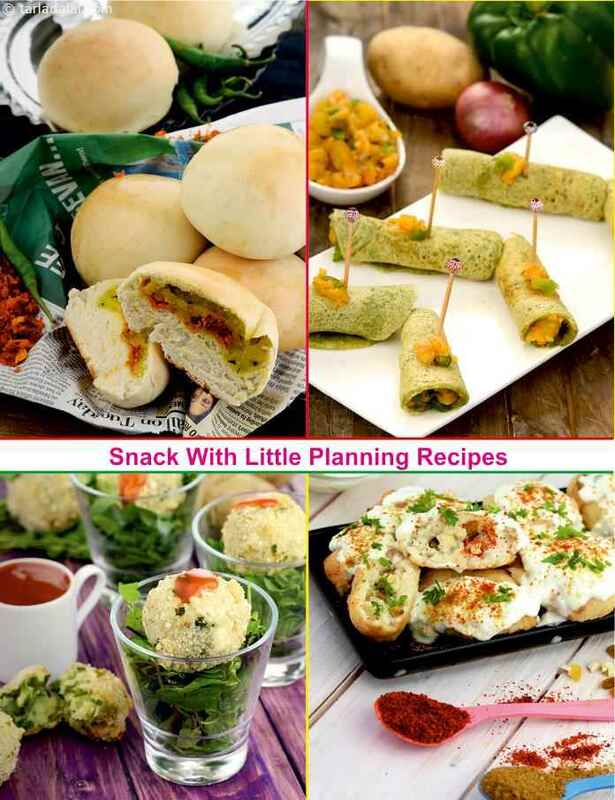 When you have a little time to plan and execute, you can go for these awesome snacks. These are not difficult to prepare but just need a little bit of pre-planning, to stock up on the required ingredients, soak some ingredients or make a batter. Some of the recipes might also take some time to execute, but the end-results are always totally worth the efforts! Treats like the Chole Samosa Chaat and Mini Bean Tacos are sure to enthrall you with their fantastic flavours and textures. The delightful flavours of cheese, garlic, celery and spring onions combine to make the spread for these sandwiches. This spread is equally good for dainty tea sandwiches or for hearty full-sized sandwiches, too. A very simple and quick snack of boiled baby potatoes coated with a pungent chutney of mint, coriander and other punchy ingredients. The lemon juice not only adds tang to the potatoes, it also helps highlight the other flavours. Phudina aloo is just the thing for cocktail parties.